4200 J of heat are added to a system. It does 5900 J of work on the surroundings. What is ΔE in J? If the correct answer is positive, it means the system gained energy. If it is negative, then the system lost energy. 3500 J of heat are lost from a gas to cooler surroundings. At the same time the gas is compressed and the surroundings do 3100 J of work on the gas. What is ΔE for the gas in J? A gas is compressed from 85.8 L to 1.6 L at 0.50 atmospheres? In addition a total of 5700 J of heat are gained from warmer surroundings. What is the change in internal energy in kJ? The combustion of 1.00 mol of liquid methly alcohol (CH3OH) at constant pressure in excess oxygen is exothermic, giving 727 kJ of heat per mole of CH3OH. Write the balanced combustion reaction using smallest whole numbers. What is the coefficient for oxygen? What is the enthalpy change (in kJ) for burning 16.0 g of methyl alcohol? Remember that the 727 kJ is per mole of CH3OH. A reaction that is used to propel rockets is N2O4(l) + 2N2H4(l) --> 3N2(g) + 4H2O(g). This reaction has the advantage that neither product is toxic, so no dangerous pollution is released. When the reaction consumes 10.0 g of liquid N2O4, it releases 124 kJ of heat. What is the value of ΔH (in kJ per mole N2O4) for the chemical equation as written? Ammonia is produced commercially by the direct reaction of the elements. The formation of 1.00 moles of gaseous NH3 by this reaction releases 46.17 kJ of heat. How much energy (in kJ) is released, when 43.0 kg of hydrogen gas, H2, reacts in excess nitrogen gas, N2? What is the enthalpy change (in kJ) for burning 6.65 g of ethyl alcohol? A 85.1 g sample of metal at 80.91 oC is added to 48.84 g of water that is initially at 22.51 oC. The final temperature of both the water and the metal is 30.09 oC. The specific heat of water is 4.184 J/(goC). Calculate the specific heat of the metal. A 52.5 g sample of Al at 93.7 oC is added to 189.6 g of water that is initially at 24.2 oC. The specific heat of Al and water are 0.90 J/(goC) and 4.184 J/(goC), respectively. Calculate the equilibrium temperature. A 65 mL solution of a dilute AgNO3 solution is added to 60 mL of a base solution in a coffee-cup calorimeter. As AgOH (s) precipitates, the temperature of the solution increases from 23.55 oC to 25.60 oC. Assuming the mixture has the same specific heat (4.184J/goC) and density (1.00 g/cm3 or 1.00 g/mL) as water, calculate the heat (in J) transferred to the surroundings, qsurr. 1 mL = 1 cm3. Now use the density of water to go from cm3 to g.
Is the precipitation reaction exothermic or endothermic? a. Exothermic because ΔH = -qsurr < 0.
b. Exothermic because ΔH = qsurr > 0.
c. Endothermic because ΔH = -qsurr < 0.
d. Endothermic because ΔH = qsurr > 0. The reaction(system) is releasing heat so the solution (surrounding) is getting warmer. Therefore the reaction is an exothermic reaction. A 161 mL solution of a dilute acid is added to 120 mL of a base solution in a coffee-cup calorimeter. The temperature of the solution increases from 23.45oC to 27.07 oC. Assuming the mixture has the same specific heat (4.184J/goC) and density (1.00 g/cm3) as water, calculate the heat (in J) transferred to the surroundings, qsurr. Is the neutralization reaction exothermic or endothermic? Dissolving 6.51 g of CaCl2 in enough water to make 345 mL of solution causes the temperature of the solution to increase by 3.51 oC. 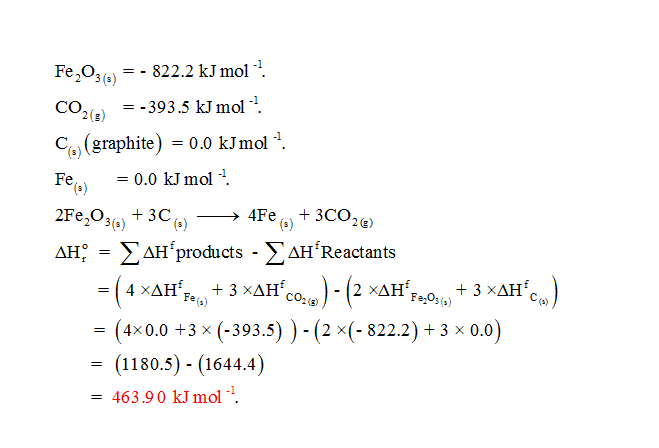 Assume the specific heat of the solution and density of the solution are the same as water′s (about 4.18 J/goC and 1.00 g/cm3, respectively) Calculate ΔH per mole of CaCl2 (in kJ) for the reaction under the above conditions. Aside, the ΔH per mole for dilution depends on the process. For example, more energy is released when starting with a large volume of water (infinite dilution), than when starting with a small volume of water. Why do you think this happens? Find the heat released per gram and convert to per mole using the MM. Is the process exothermic? If, yes, then what is the sign for ΔH? Use the standard enthalpies of formation from Appendix II (A-7 to A-12) to calculate the enthalpy change (in kJ) for the photosynthesis of glucose at 298 K and 1 atm. Is the preceding reaction endothermic or exothermic? Frederick Trouton noted that the enthalpy of vaporization of 1 mole of a pure liquid, expressed in joules, is approximately 88 times the boiling point of the liquid on the Kelvin scale. This relationship is called Trouton's rule and is represented by the thermochemical equation: liquid → gas, ΔHvap = 88 Tbjoules/mol. Combined with an empirical formula from chemical analysis, Trouton's rule can be used to find the molecular formula of a compound, as illustrated here. A compound that contains only carbon and hydrogen is 85.6% C and 14.4% H. Its enthalpy of vaporization is 389 J/g, and it boils at a temperature of 322 K.
First, determine the empirical formula of this compound using the percent composition of H and C. What is the empirical molar mass (in g/mol)? Use Trouton's rule to calculate the approximate enthalpy of vaporization (in J) of one mole of the compound. Using the result from the preceding question and the experimental ΔHvap of 389 J/g, find the approximate molar mass (in g/mol). This is a simple multiplication. Using units, you can see how to multiple the information to get the approximate molar mass or g/mol. What is the molar mass correct to 4 SIG. FIG.? You know the approximate molar mass. Use the empirical formula to get the actual molar mass. The price of gold is $625 per troy ounce at this writing. How much heat (in J) is needed to raise the temperature of $5000.00 worth of gold from 14.2 oC to 80.6 oC? Review of multiplication by 1. Note, periodic table has additional needed information. Problems27-31. The law of Dulong and Petit states that the approximate molar heat capacity of a metal is 25 J/(mol.K). Experimentally, the specific heat of a metal is found to be 0.460 J/(goC). Use the law of Dulong and Petit to calculate the approximate molar mass of the metal. A chloride of this element is 67.2% chlorine by mass. In a 100 g sample how many moles of chlorine are there? (This info will be used to determine the empirical formula. Because the accuracy of the result in the last question for this set of questions depends on the accuracy of this answer, use the atomic mass of Cl accurate to 4 SIG. FIG.). Hint, use the approximate molar mass found earlier. Determine the subscripts x and y in the empirical formula of the chloride. MxCly (The mole ratio of the elements you find will not be exactly whole numbers, so considerable rounding is needed to obtain whole numbers in the formula.) What is y? Answer must be a whole number. You know how many g of metal are in the 100 g sample. You can find the actual (not just approximate) moles of metal because you know the moles of chlorine in a 100 g sample and you know the relationship between moles of metal and moles of Cl (preceding question). Determine an accurate molar mass for the metal. ANSWER NEEDS TO BE RIGHT FOR 3 SIG. FIG.